Attacks on five Birmingham mosques are not being treated as terror-related and were not motivated by right wing extremism, police said. 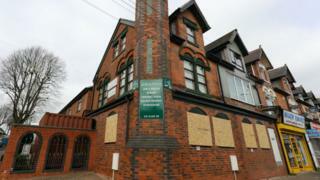 Three mosques in Aston and two others in Perry Barr and Erdington had their windows smashed on Thursday. A 34-year-old man from Perry Barr handed himself into police on Friday and was detained under the Mental Health Act. Detectives are not seeking anyone else in relation to the attacks. A separate investigation is continuing after a window was smashed at a mosque on Cromer Road in Balsall Heath on Saturday. It is not being linked to the earlier attacks. West Midlands Police said it has conducted a thorough investigation supported by the West Midlands Counter Terrorism Unit. Assistant Chief Constable Matt Ward said officers are working with mosques and local communities around the West Midlands and there will be a visible police presence in "key locations" to reassure residents.